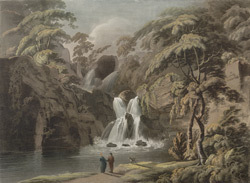 View of the upper series of waterfalls at Rydal in Cumbria, near the tranquil Rydal Water. Wordsworth advised visitors: "Rydal mere is nowhere seen to advantage from the main road. Fine views of it may be had from the Rydal Park; but these grounds, as well as those of Rydal Mount [the poet's home] and Ivy Cottage, from which also it is viewed to advantage are private." Rydal was a small, scattered village along a main road into the Lake District.